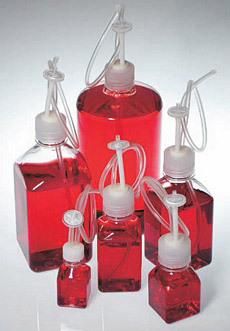 Bio-Simplex™ sterile bottle assembly systems are available in a range of commonly used sizes (from 60-mL to 2-liter). Each system includes a PETG bottle (the 2-liter bottle is polycarbonate) and a 2-port EZ Top® Closure Assembly consisting of a 0.2 µM vent filter, an 18-inch length of tubing with a plug end, a notched dip tube that extends to the bottom of the bottle, and a polyethylene cap (the 2-liter cap is polypropylene). The EZ Top® assembly is made from C-Flex® pharmaceutical grade thermoplastic elastomer (TPE) resin. The entire system is engineered to ensure an unobstructed fluid path, extremely low levels of extractables, and a secure elastomeric seal between closure and bottle. Economically designed for the single-use market, these systems are easily used with sterile connecting devices and thermal tubing sealers. They are sold as single items, double-bagged and gamma irradiated for a Sterility Assurance Level (SAL) of 10-6. For unique applications that require modification or customization, contact our customer service department. Customer-generated designs, sizes, packaging and other options — such as connectors, heat-sealed ends or alternate bottle materials — are available on request. Bio-Simplex™, EZ Top® and C-Flex® are trademarks of Saint-Gobain Performance Plastics.